You can not select a spirit guide. The guide must select you. That is the way of the spirits. It matters not what your blood line is or if you were born into the Wolf Clan or The Bear Clan. 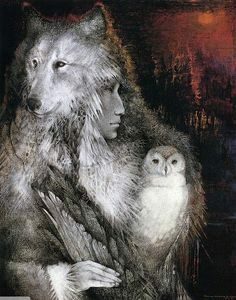 Nothing will assure you of having the Wolf or the Bear as your spirit guide. Be you Native American or Hawaiian, Irish or Italian, French or English, or plain old Hash, it makes not difference. Your Spirit Guide must select you. For some, their spirit guide makes itself known when they are young. For others not until they reach adulthood. Still others must search for their guide. For some their guide will be with them long before they are aware of it. Having said that, I will speak to you from my heart and tell you the story of how I found one of my guides, the Wolf. Looking back over my life I am often awed that I have a spirit guide. I am awed that I was selected by such a spirit in the first place. Baptist) let us children choose a church for our family. As I grew into adulthood I began to study the religions of the world. I found them interesting but lacking in any form of fulfillment. I borrowed a bit here and there from these religions. I learned the chanting of OM and how to meditate from the Zen Buddhists. I Attempted to Learn how to keep myself centered. As time passed and I became an adult I dropped all pretense of having a formal religion as dictated by my world. In the early sixties I became involved in muzzleloading and buckskinning. This led to friendships with people of the Native American community. As these friendships grew I began to study the history of these people and their belief systems. I felt comfortable with many of these beliefs, as though they had been with me before, as though somehow they where right and belonged to me as well. I also looked into my Hawaiian heritage tracing my blood line back to ancient Hawaii. I was surprised to find so many similarities between the two cultures and their belief systems. As the years passed, much of this was forgotten; marriage, children, the earning of a living, all demanding much from me. In the late sixties and early seventies I lived in the back country of southern California, high on a mountain overlooking the Ramona Valley. This area was made up of mostly high chaparral and massive granite boulders, with a few groves of large California Oak. It was here, while on a walk, I first met him. I stopped in the shade of an oak tree and looking up the shear face of a boulder, I saw him. He lay on a shelf near the top of that massive rock looking placidly down at me. It was a large wolf. A wolf in a place where there should not be one. As I gazed into its eyes it was as though my eyes zoomed, closing the space between us, to look closely into those incredible eyes. After what seemed an eternity, I lowered my gaze and walked away. I later told myself that I had seen a domestic dog, perhaps a German Shepherd, gone wild. It could not have been a wolf, not in this part of the country. Yet the vision of those eyes stayed with me. That vision would show up in my dreams. It would sometimes show up while I was engaged in some activity or work. Still, I thought little more about it. In 1976, I went to Alaska and worked on an archeological survey of Prince William Sound as part of the Native Lands Claims Act. Which was funded by the U.S. Park Department and the Chugach Native Corporation. After the survey I moved to an isolated cabin outside of Cordova while we worked on cataloging the information from the survey and map making. It was here at this cabin that I ran into him again. I was cutting and splitting wood in front of the cabin when I looked over at the edge of the forest. There sat a large wolf watching me. Not just any wolf but an identical one to the wolf I had seen in California. Our eyes locked and my vision again seemed to zoom to his eyes. I stood transfixed starring into those wonderful, intelligent eyes for I know not how long. Time seemed to stand still for me. I was aware of a feeling of serene peace. As quietly as he had appeared, he casually rose to his feet, turned, and vanished into the woods. I remember thinking simply, “that was cool”, as I returned to the task I had been working on. Now, it is true that some of us are a little slow from time to time. Looking back now I realize that in my case I must have just fallen off the turnip truck for while I thought the experience interesting, I never really connected these two wolf incidents in my life even though the image of those eyes was always with me. Years passed and I found myself living in the panhandle of northern Idaho. I spent much of my free time happily wondering through the forest, flintlock rifle in hand. I knew all the game that shared the 132 acre site I lived on. The deer, the spring bears, (before they moved to the higher mountains for the summer), the occasional moose and forest elk that traveled through. I knew where the deer grazed, where they bedded in the early mornings and at night. I was attuned to this place, the comings and goings of its denizens in both winter and summer. It was here during a late spring day shortly after a rain shower, with the trees still dripping water and the sun burning through the clouds that I saw him again. Working my way through the trees I came to the gravel road that crossed the property near an old decomposed granite pit. There laying on a knoll was a wolf … the same wolf I’d seen twice before. I knew him the second I saw him. Our eyes met and again my vision seemed to zoom across the space between us to look into those knowing eyes. At that moment my life changed forever for I knew then and there that this was my guide. As the years have rolled by I continue to see those eyes. At times that I am stressed, or not sure of my path, or challenged, or just feeling down. They have appeared as a warning not to enter a canyon in the southwest desert, and as a warning not to go on a certain outing. They have given me solace and comfort at times it was needed. At times of uncertainty or trouble they are with me and when they appear my mind is cleared and I know what to do, how to solve a problem or where I’ve gone wrong. He is with me always, day and night. I need not close my eyes to look into his, I see them in my minds eye floating before me. Those eyes speak to me in a silent voice that I have come to rely on and they have guided me well.